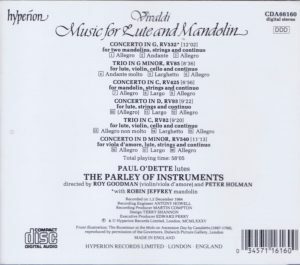 Recorded in December 1984 and published on CD in 1986, this program of Concertos and Trios with Mandolin(s) and/or Lute(s) was overall very satisfactory when it came out. But, in 1993, the competing recording by Il Giardino Armonico was published by Teldec, 4509-91182-2 – and there was no going back. First, Teldec adds the very substantial Concerto RV 558 for 2 recorders, 2 “tromba marinas” (contrary to what you’d expect, instruments of the violin family), 2 mandolins, 2 theorbos, 2 salmoes (a predecessor of the clarinet) and one cello, one of Vivaldi’s greatest concertos (among many great ones), and for a more generous TT of 65 minutes vs 58 for Hyperion. Second and more important, in the absence of anything better, the interpretation of The Parley of Instruments would have overall given ample satisfaction, and did. Tempos are always lively and sprightly in the outer movements, even their middle movements are occasionally animated, which avoids any waling sentimentality while, to my ears, losing none of the music’s beauty and dreamy tenderness, and the lean tone, astringent even, produced by what seems to be a very small body of strings, apparently one to a part, would not have been a major deterrent; on the contrary it is an entirely acceptable approach in that music, and it’s probably not a coincidence that it is in the chamber concerto RV 93 (two violins, lute and continuo) and the two Trios RV 82 and 85 that, in comparison to Il Giardino Armonico, The Parley of Instruments hold up their best. But now we have Il Giardino Armonico. And (with, playing by ear, a somewhat larger ensemble) they produce so much more energy and excitement – not so much a matter of tempos as of attack, mass, drive -, and show so much more imagination in their phrasings, articulation and ornamentation. 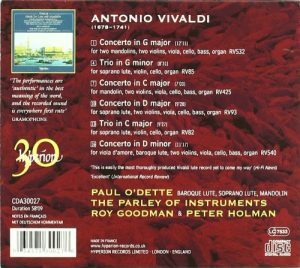 I’ve compared Il Giardino’s Vivaldi to a roller-coaster – going down. 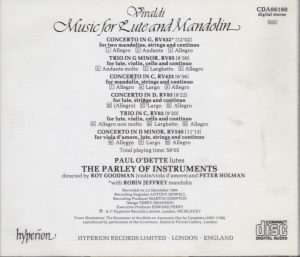 The Parley of Instruments is a charming boat ride on the canal. But it’s not just, or not always a matter of drive and energy. It’s also the poetic imagination brought to bear by Il Giardino in the slow movements, and nowhere is this better illustrated than in the Larghetto of Trio RV 82: as beautiful as it is in itself with the Parley of Instruments, Il Giardino is simply in another dimension, through two incredible touches of imagination and freedom: playing the lute’s grace notes as glissandos, and playing the continuo and solo violin pizzicato, changing the music into raindrop or tear music – and really, turning a very pretty Larghetto into one of Vivaldi’s most sublime inventions. 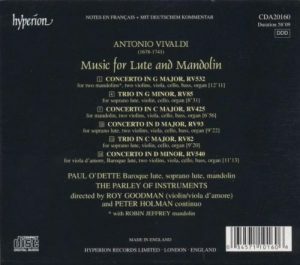 In the same vein, in the middle Andante of Concerto RV 532 for two mandolins, the choice of Parley of Instruments to play the basso continuo arco rather than staccato, may have been a matter of edition – the old Malipiero edition indicates staccato here, but I don’t know what the original score says. Still, even supposing it is more “urtext”, it’s unfortunate, because again, as shown by Il Giardino Armonico, playing it staccato creates again one of those mesmerizing raindrop effects. 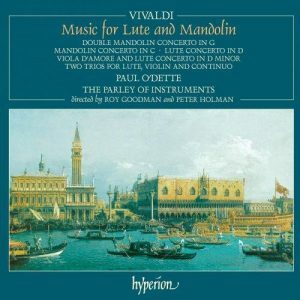 And that The Parley’s two mandolinists, Paul O’Dette and Robin Jeffrey, don’t trill in RV 532 (or anywhere else) where Vivaldi indicates to do so (and unlike every other performers I’ve heard in these works) must also be counted among the unfortunate casualties of their recording. 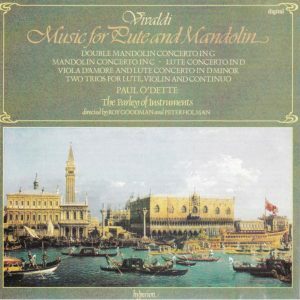 But the most objectionable (and I’m even tempted to say: the worst) happens in the Mandolin Concerto RV 425. 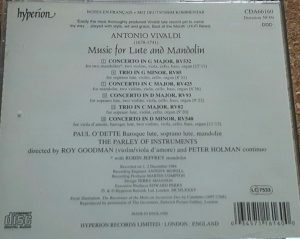 There, even the Malipiero edition indicates that the manuscripts requests that “if possible the violins should play pizzicato”. With The Parley, they don’t. 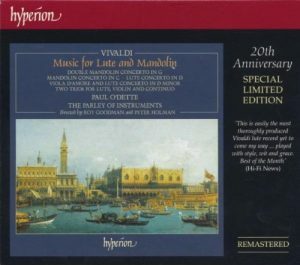 Just listen to Il Giardino to hear how beautiful, how Venetian the effect is, like some giant cimbalom in the first movement, and with a truly breathtaking restraint in the Largo, drops of mandolin against a few punctuations from the strings. 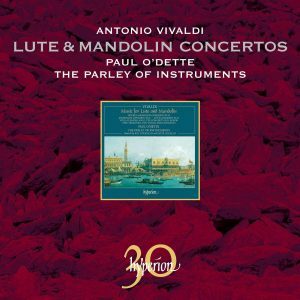 The Parley’s unfortunate interpretive choice here turns into a nice, but no more than ordinary (for Vivaldi) concerto one of the Pretre Rosso’s most sublime (again) inventions. Nonetheless the Hyperion recording can still earn a guarded recommendation – as a complement to Il Giardino for those ready to go on the roller-coaster, and as a possible substitute for it for those whose heart condition would bar them from doing so; but they need to know that they’ll be missing something truly unique. Hyperion has a great website and you can see and download the digital booklet of this CD.